Prev Get Ready For Super Bowl Snacking Next Chinese New Year: Year of the Horse Mask! Valentine’s Day is just around the corner again, and the hunt for new ways to create candy valentines for classmates is on. 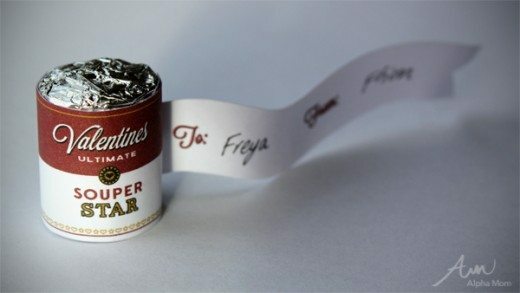 This miniature can of soup is an easy to put together class valentine that contains a mini Necco Wafer roll. 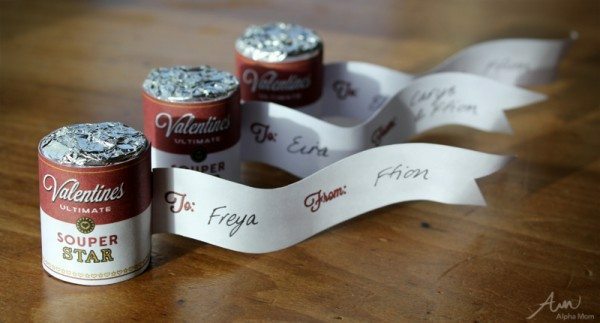 All you need to make them are your mini Necco wafer roll, our Valentine printable, some aluminum foil, scissors, a pen, and some glue. 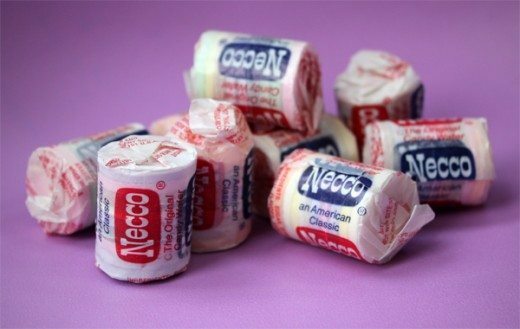 Below you can see the mini rolls of Necco Wafers that are wrapped up inside. You will need to roll each little cylinder of candy up in a piece of aluminum foil measuring approximately 10cm x 6cm. It’s easy and quick to cut up your foil by placing a ruler down on it where you want to cut and just ripping the foil up along the ruler, rather than using scissors. 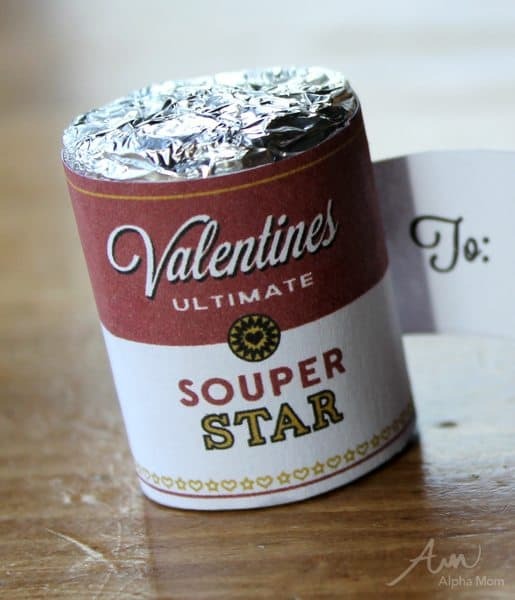 The one page “Souper Star” valentine printable has enough cut outs to make six valentines. You can print onto white card or paper, as either works well for this. For best results print it on a high quality print setting, so that the tiny lettering on the soup can design is clear and you can also see the fine lines around the banner to guide your cutting. 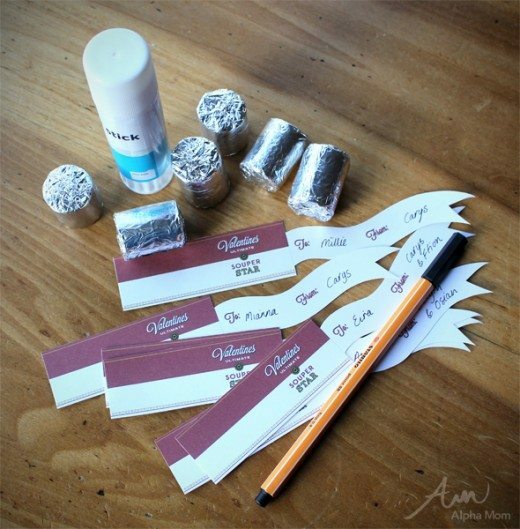 Once you have your labels cut out, all you need to do is write yours and your class valentines‘ names on the banner, fold the line between the label and the banner on the cut out so that it sticks out from the soup can, and seal them around your foil-wrapped mini Necco Wafer rolls. Ever so cute and tiny, and perfect for little Souper Stars. (one of our readers caught a typo; “Valentine’s” was missing the apostrophe. Even though the pictures still reflect the typo, the printable has been fixed). I love this! Great design. Debbie, it’s fixed. The new printable is up. Thank you. Thank you for your cute idea and printable!